Sen. Lindsey Graham, R-S.C., let loose on his Democratic colleagues Thursday over what he called the "sham" hearing to probe sexual assault allegations against Brett Kavanaugh, in a display that earned him praise from the White House and scorn from the left. Graham blasted Democrats toward the end of the Senate Judiciary Committee hearing with the Supreme Court nominee and accuser Christine Blasey Ford. She alleges Kavanaugh forced himself on her when both were high school students in the 1980s. Graham personally addressed Kavanaugh to apologize for the questioning of his high school yearbook comments and his beer drinking habits. Democratic senators have been bringing up Kavanaugh's yearbook as they question him about Ford's allegation of sexual assault when they were teens. Kavanaugh denies the allegation. The senior senator from South Carolina also had pointed words for any Republican senator who is considering not voting to confirm Kavanaugh. Graham’s words drew quick praise from White House officials, with President Trump’s counselor Kellyanne Conway praising the lawmaker for “excoriating the outrageous and unfair treatment” of Kavanaugh. Press Secretary Sarah Sanders also tweeted her support for Graham’s words. Graham’s words also drew mockery on social media from Democratic pundits, including former Secretary of State Hillary Clinton aide Philippe Reines who said that Graham was auditioning for vice president. 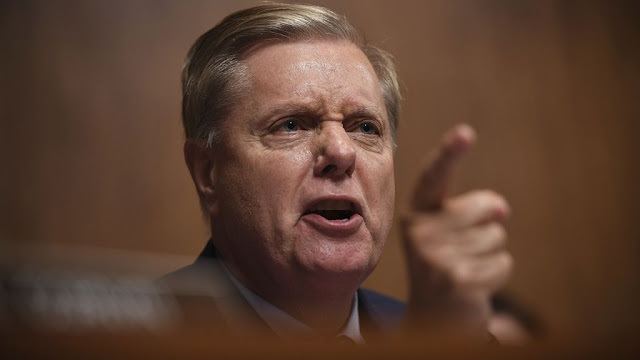 Up until now I’ve thought Graham has been auditioning for Secretary of Defense or Attorney General. He’s shooting for Vice President. Speaking to reporters during a break in the hearing, Graham said that he "had enough of this charade."